In July 2014 CUFE Business School and GfK Verein (now: Nuremberg Institute for Market Decisions) successfully concluded the first Summer School on Market Research and Innovation. 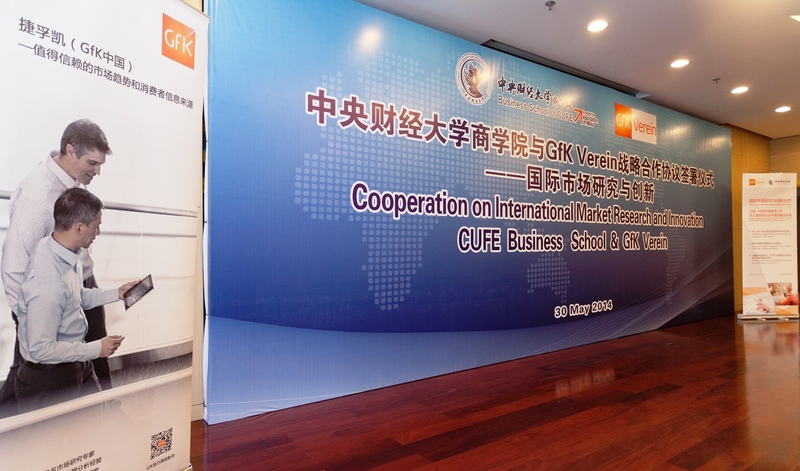 The course was offered in collaboration between the Business School of the Central University of Finance and Economics (CUFE) in Beijing, one of China’s leading universities, and GfK Verein, a non-profit think-tank for the advancement of market research in Nuremberg, Germany, which is also the anchor shareholder in GfK SE, a leading international market research company. As part of the course, 25 students from CUFE engaged with a faculty of internationally recognized academics and executives on topics ranging from qualitative and quantitative market research methods via modern analytical software to social media, big data and innovation. The Summer School also received very good feedback from the students, who enjoyed the opportunity to interact in English with an international faculty, and a number of students expressed an interest in a site visit or internships with GfK in China. The course concluded with the handing over of the certificate awarded for actively participating in the course and passing the exam. Based on this successful pilot course, CUFE Business School and GfK Verein have deepened their cooperation in 2015 with a second summer school as well as research cooperation. “We are looking forward to the opportunity to invite a delegation from CUFE Business School over to Nuremberg.” said Prof. Raimund Wildner of GfK Verein. 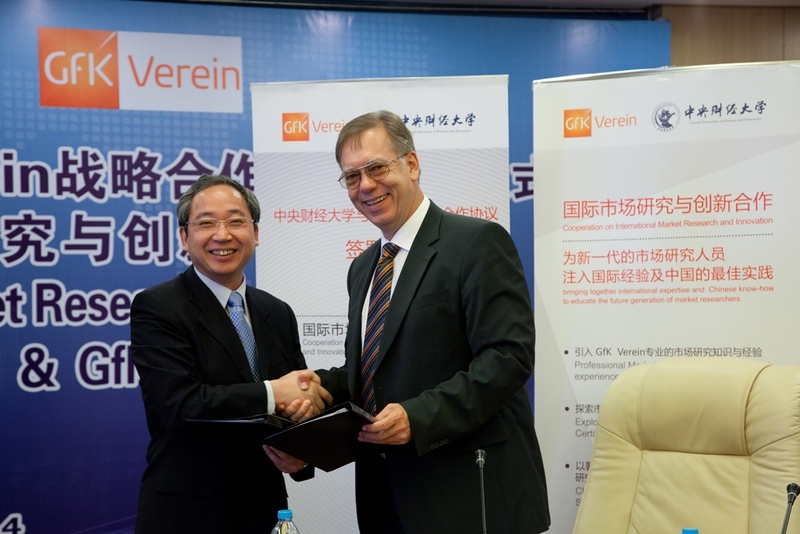 In June 2014 the Business School of the Central University of Finance and Economics (CUFE), and GfK Verein, signed a cooperation agreement to advance market research education in China. The course links global expertise on International Market Research and Innovation with in-depth knowledge of the market and the teaching expertise of a top Chinese university. 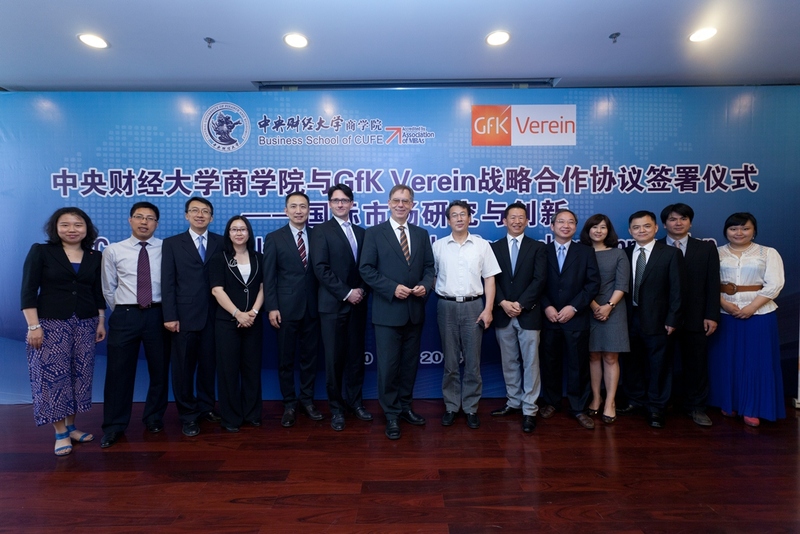 In a meeting hosted by Vice-President of CUFE LI Junsheng, Prof. WANG RuiHua, PhD, CPA, Dean of the CUFE Business School, and Prof. Dr. Raimund WILDNER, Managing Director and Vice President of GfK Verein signed the agreement signaling the start of the cooperation. Already in summer 2014, selected students from CUFE Business School were able to attend an intensive two-week course on “International Market Research and Innovation” held by an international faculty of distinguished academics and senior business executives. The syllabus included: Basics of Market Research, Quantitative Market Research, Qualitative Research and Ethnography, Research Design and Project Management, Statistical and Analytical Methods, Tools for Data Analysis and Visualization, Designing Experimental Studies in Market Research, Social Media and Big Data in Market Research, From Data to Insights and Customers as a Source of Innovation.